Comic cons two weeks in a row? Why not?!? Chicago is one of my favorite cities in the world. I lived there for a few years out of college, then again for a few years after grad school. My kiddo was born there. It’s special to me. And C2E2 is an excellent show in itself. I’m super looking forward to this weekend. Also! I’ll be speaking about Macbeth: The Red King on the American Library Association stage Friday at 4. If you’re at the con, please do stop by! 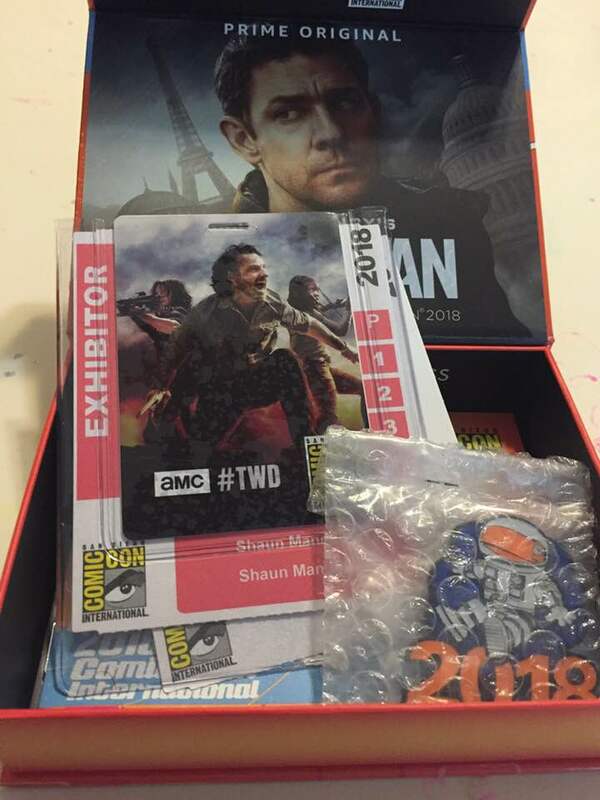 San Diego Comic-Con is less than two weeks away! I'll be at Artist Alley table AA-19 with copies of Macbeth: The Red King, Star Wars Adventures, Interesting Drug, Hell, Nebraska, and maybe a few other things. I'll also be doing a few Star Wars Adventures signings at the IDW Publishing booth, which should be rad. I love SDCC, I really do. It's just such a spectacle. And I love getting to see industry friends -- and pretty much everyone is there -- and meeting new folks. After a number of years reporting on the show for Comic Book Resources, this is my first year with a table. It's thrilling and terrifying. If you're at the con, come say hi! In addition to SDCC, I've been busy with a couple more projects. One is a Superhero Thing with artist Ross Taylor, which we're hoping to debut next year. The other is Another History Thing, set a few hundred years after Macbeth and not in any way a sequel. But it's super fun. I'm pretty deep into research mode now, even trying to read a couple books in French. It's going... actually much better than I thought it would. Thanks, Duolingo! This weekend I'll be exhibiting at Ann Arbor Comic Arts Festival, my most local convention and one that I really enjoyed last year. It's a very kid- and youth-focused show (it was previously called Kids Read Comics Festival), and this year I actually have kid-friendly comics to sell! Thanks, Star Wars Adventures! I'll also have copies of my previous books Hell, Nebraska, Interesting Drug, and the IF: Crime anthology -- no Macbeth for now, sadly, as our the demise of our intended printer has led to delays. Aiming to have copies for San Diego Comic-Con next month and get books out to Kickstarter backers around that time, as well. Hope to see you round the cons! Thanks for supporting Macbeth on Kickstarter! Thanks to everyone who supported Macbeth: The Red King on Kickstarter! Because of you, we'll be able to bring this book to life in style, with both an oversized paperback and exclusive hardcover edition. If you missed the Kickstarter but would still like a copy, you can catch me round conventions this summer, pre-order through this very website, or stay tuned for announcements on retail distribution. We expect copies to go out to backers in June, wider release schedule will depend on the particulars of our distribution partner. Currently working on another thing I hope to be able to announce soon. Follow me on Twitter and sign up for email updates to stay in the know. ;-) Thanks! Thanks for a great C2E2! Chicago's C2E2 was a ton of fun, met a lot of great people and it was really heartening to see all the interest in Macbeth: The Red King. There are ten days left in the Kickstarter campaign, and our goal is well within reach! I'll be honest, it was a bit weird trying to talk up a thing that lives online while surrounded by so many creators with great books you could take home right now. But the sample copy of Macbeth I had on hand I think gave folks a good idea of what we're trying to accomplish with this project. And I so appreciate that people are still responding to my earlier books with Anna, Interesting Drug and Hell, Nebraska. My big purchase at the con was the Source Point Press/Comics Experience bundle. I've been a member of the CE workshop forums for ages, and took the in-person classes in New York before operations moved online. Andy Schmidt, who was an editor for Marvel and IDW before founding Comics Experience, is a fantastic resource for creators who want to improve their craft and develop their comicking careers. I'm pretty excited by the new publishing initiative, and after meeting and hanging out with Frank Gogol at C2E2, I'm especially looking forward to reading his short story collection Grief. Looking forward to my next convention, the Ann Arbor Comic Arts Festival in June. Thanks to everyone who stopped by, and to all of you supporting Macbeth: The Red King on Kickstarter! After that, I'll be attending but not exhibiting at Motor City Comic Con in May, then I'll have a table at Ann Arbor Comic Arts Festival June 16-17 and will be a guest of Lansing's Get Geek'd Entertainment Expo July 28-29. Also working on plans for San Diego Comic-Con -- stay tuned! The Macbeth: The Red King Kickstarter is going strong! We've got a ways to go until meeting goal, but we've got plans in place to finish strong. Thanks so much to everyone who's supported the campaign so far -- if you think the book looks rad, tell your friends! I'll have Macbeth pins (also known as badges) at C2E2 for Kickstarter backers -- stop by and say hi! Macbeth: The Red King Kickstarter is Live! I hope you'll consider supporting the project! Thanks so much! The name “Macbeth” has been cursed for hundreds of years, synonymous with tyranny and over-vaulting ambition. But what if the true Macbeth was something other than the villain Shakespeare portrayed? Macbeth: the Red King tells an entirely new story of the real-life Scottish monarch, revealing a benevolent ruler who seized on his legitimate claim to the throne. Drawing from historical sources, this engaging graphic novel by Shaun Manning and Anna Wieszczyk is visually stunning companion to Shakespeare’s legendary drama. See Macbeth vanquish the incompetent Duncan, nurture a difficult relationship with his stepson Lulach, and make pilgrimage to Rome while his noble wife minds the restless kingdom — and witness his last stand against the insurgent prince Malcolm. Macbeth: The Red King is not a re-telling of the Shakespeare classic, but rather a new history of the famous Scottish king. This book is not only for comic fans, but can be a great tool to help educators and students create a visual introduction to some of the greatest literature in our history. I reckon it doesn't hurt that the lead story stars The Last Jedi debutante Rose Tico in her first comic book appearance, written by NYT bestselling author Delilah S. Dawson and illustrated by Eisner Award winner Derek Charm. It's also been a delight to get to know the team behind "Podracer's Rescue" a bit via Twitter, really hoping we get to meet along the convention circuit this year. Star Wars! I'm in a Star Wars comic! January's Star Wars Adventures #6 features a six-page "Tales from Wild Space" backup story by me, artist Chad Thomas, and colorist Charlie Kirchoff. You can imagine how thrilling this is. "Podracer's Rescue" sees young Anakin Skywalker saving the day shortly before the events of The Phantom Menace. The main cover highlights the lead story, featuring new character Rose from The Last Jedi (also a treat! ), while the B cover shows Anakin and Sebulba facing off. Check in with your local comic shop or pre-order on Comixology! Hoo man, this is the first time I've done conventions on back-to-back weekends, but both of these are quite exciting. First, I'll be at Ann Arbor Comic Arts Festival June 17-18, my first time exhibiting at my hometown library's con. 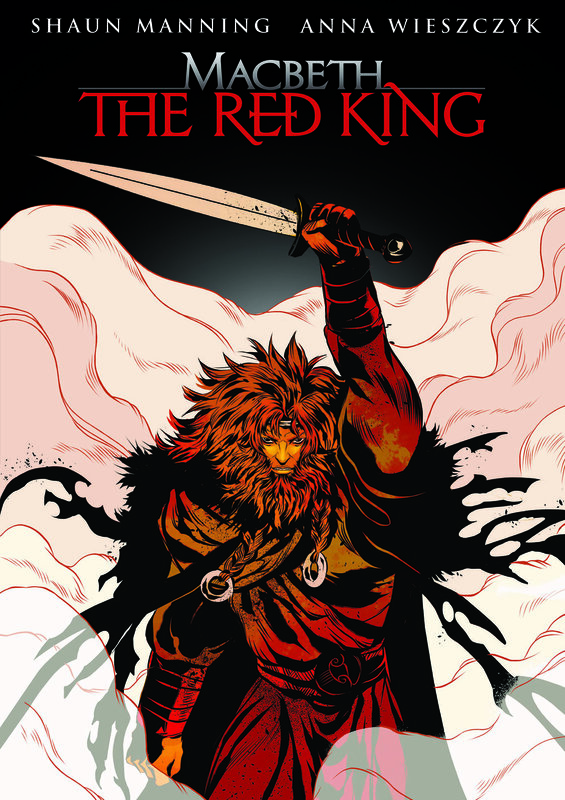 This will also be the Michigan debut of Macbeth: The Red King, after gaining a good deal of interest at C2E2 in Chicago. Then! I'll be in Artist Alley at the American Library Association's annual conference. I'm thrilled for the opportunity to talk about my Macbeth project with librarians, as I think there are so many excellent educational opportunities for a book like this, that takes a universally known character from history and shows a completely different side to the story. Looking forward to seeing old friends, meeting fans, and talking comics in A2 and Chicago! Stop by if you're 'round. My first con of the year! Always an exciting time. I'll be in Chicago this weekend for C2E2, hanging out in Artist Alley booth D3 with "Spencer and Locke" creator (and Newsarama editor) David Pepose. I'll be debuting "Macbeth: The Red King," and if you know how long I've been talking about this book, you can imagine how excited I am to have copies in my hands and to be able to share it with the world. I also just got word that I've been approved to exhibit at the American Library Association conference in June. This isn't part of my regular con circuit, but for a project like "Macbeth" it's an exciting opportunity. And of course, as someone who works for a library, it's exciting in its own way. After a good run at Kansas City Comic Con, I'm nearly sold out of the Kickstarter-funded print edition of Hell, Nebraska volume 1. That book was oversized; for the new one, I'm going the other way, with a 5x8" manga-sized volume. The thought right now is to go through Amazon's Createspace to assist in fulfillment, though that will depend on what the proof looks like and how the costs break down (cautiously optimistic). The question is, should it be color or black and white? It's not my most polished work, but it makes me smile. Thought I'd share. More to the point! This summer will see publication of my next graphic novel with Anna Wieszczyk. It's called Macbeth: The Red King and has nothing to do with Shakespeare. (Ok, maybe a few things. But it's entirely different story.) It's about a noble warrior reclaiming his birthright, ably leading a war-torn country through both grace and force, and how the love of his royal wife gave him the strength to rule but the bitterness of his stepson threatened to unmake everything. It's not the "real" story of Macbeth, but neither was Shakespeare's; instead, it's a story of Macbeth, and I'm quite proud of it. I'll have early copies at Ann Arbor Comic Fest in June, the book will see a wider release in August through indie publisher Lucha Comics. Sign up for my email newsletter to hear about how to order or where I'll be signing, and/or follow me on Twitter for very regular updates -- I'm gonna be insufferable on Twitter when this comes out. I'm doing a Reddit Author Spotlight AMA today, November 22, from 11am-4pm EST. Come say hi! Like a lot of writers, I expect, I've got a ton of projects in various stages of completion -- concepts, scripts, a few things with artists attached, and a very select few with publishers/publication plans. Most sit for a good long while before I can find an artist and get the real #makecomics process going. I met Fernando Pinto at New York Comic Con, both of us hanging out at Fred Van Lente's table. I had a look at his portfolio. We exchanged business cards. I knew I wanted to work with him -- his samples were eye-catching and displayed a range of style -- but I didn't know what I had for him. A day or so after getting back to Ann Arbor, a phrase popped into my head in shower. It was a pretty dumb phrase, but it made me smile. I had an idea for the tone and style of what this thing might look like as a comic, but no story as yet. I threw it out to Fernando anyway as something we might work on together. He liked it, so then I had to write it. And I kind of love it. AND! He's already got sketches! All of this in the span of a couple weeks. There have been a few other developments on this since, as well. So excited at how quickly this weird little project is moving, and I hope to have more to share soon. Come see me at Stan Lee's Comikaze! Wow, it's been a while since I had a table! But I'll be exhibiting as a guest of the Comikaze comic con in Los Angeles Oct. 30-Nov. 1. Come by to chat at Artist Alley table N09, where I'll have copies of Interesting Drug; Hell, Nebraska; Garbage Pail Kids; and the brand-new hardcover 27: A Comics Anthology, featuring tales of rock stars who left us too young. There will probably be free bananas. I'll also be on a panel Sunday at 1:00 pm talking about Geek Love, so check that out. November sees the release of two awesome anthologies to which I am a proud contributor. In the annual Thought Bubble anthology (Image Comics), tying in with the convention in Leeds, England, artist Meredith Moriarty and I have a one-page vignette about how we cope. 27: A Comics Anthology (Red Stylo/Action Lab) has a personal essay about hearing of Amy Winehouse's death during San Diego Comic-Con, and how the people around me responded. Check 'em out, in stores and online. Panel from "Nice Dream," an upcoming short story by myself and Meredith Moriarty. We may be working on something longer, as well -- stay tuned!